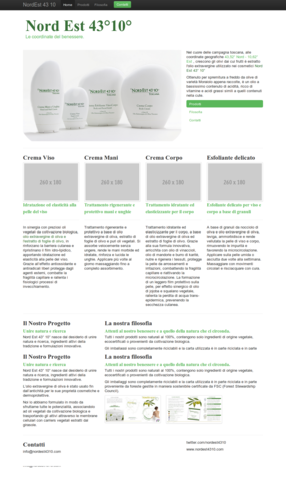 Nordest 4310 is a company born in Tuscany that produces innovative cosmetics based on olive oil and natural extracts. Its mission is to combine research, tradition and attention to the environment into unique products, 100% organic, which donate a real comfort to the skin. Nordest 4310 choose the colors of nature and pure oil, green and gold, for the logo and for the packaging; basic shapes that evoke sails to the wind or river pebbles for the rounded bottles. The concept of the web site expresses the maximum ease and simplicity of ingredients, mixed in an innovative and fresh manner. Nordest 4310 website is using Twitter Bootstrap as a html5/css3 framework. It features a grid layout and a mobile friendly, responsive design.